A Titanfall 2 teaser has just landed and it’s literally just a flash of metallic leg. Ohh, matron. 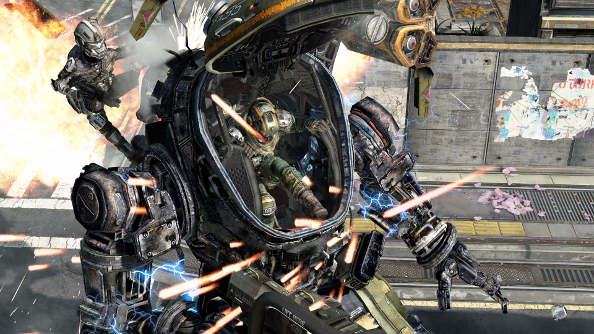 Titanfall 2 will join our list of upcoming PC games as soon as we get a release date. Respawn Entertainment have led with one of those announcements of an announcement that are suddenly so popular, but at least we got a little sneak peek at some juicy new stuff – like a massive flipping sword! It looks like titans will be able to properly duke it out melee style this time, which could produce some incredible scenes. Let’s just hope they nail the controls, so it’s not just a case of who can smash their face into their keyboard the fastest. Other clues are light on the ground, but trailer guy’s accent suggests a South African setting. We’ll find out properly on June 12 when the actual reveal happens. Check out the teaser below and head over to the new Titanfall 2 site to follow any upcoming announcements.